Despite suffering their first defeat of the season in a close loss to the #2 Arizona State Sun Devils, Cal Poly continued to rise in the polls on the strength of their big win over #20 Dominican and a 4-1 record to start the season. The Mustangs are now ranked in the #5 spot in this week’s MCLA Coaches Poll , their highest ranking since the 2012 season, when they narrowly missed earning the MCLA National Championship title. The Mustangs will face two more tough opponents at home this weekend as they welcome WCLL Divisional rival Stanford and the #12 Westminster Griffins. Cal Poly takes on the Cardinal at 2 p.m. on Saturday. The Mustangs hold a commanding 12-1 series lead against Stanford over the past decade and have not lost to them since the 2008 season. 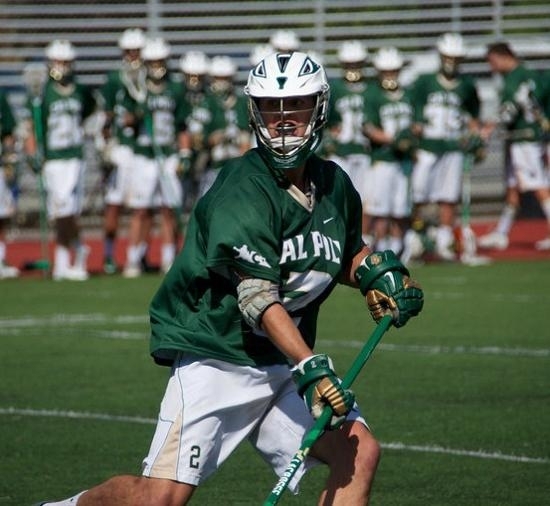 On Monday night, Cal Poly hosts the Westminster Griffins from the always powerful Rocky Mountain Lacrosse Conference (RMLC). This could mark one of the last meetings between the two teams as Westminster will leave the MCLA next year and join the NCAA Division II varsity ranks. The two teams played only once before, and it was Westminster knocking off Cal Poly in Salt Lake City last season. The Mustangs are hoping to use their home field advantage to knot the series at one game apiece. Both of the games this weekend will take place at the Upper Sports Complex on the Cal Poly campus. Saturday, March 7th, 2015 at 2:00 p.m.
Monday, March 9th, 2015 at 7:00 p.m. The Upper Sports Complex is located on Sports Complex Road past Baggett Stadium. Field 1 is located at the far end of the synthetic turf fields, furthest from the baseball stadium. There is a large seating area on the grass hill adjacent to the field, but there are no bleacher seats available. After opening up the season 3-0 with convincing wins over UCSB, San Diego, and the #21 ranked San Diego State Aztecs, Cal Poly checked in at #8 in the first Under Armour MCLA Coaches Poll of the regular season. The Mustangs defense has been impenetrable during the first three games allowing just over 3.5 goals per game. 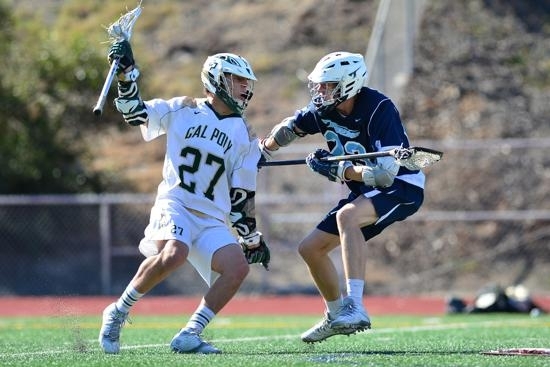 In order for Cal Poly to remain undefeated, the defense will need to continue to perform well as two of the highest scoring MCLA teams in the nation come into SLO Town for a double-header weekend. On Saturday at noon, Cal Poly will square off against the #16 Dominican Penguins from San Rafael in the first ever matchup between the two programs. Dominican entered the WCLL this season after dropping their NCAA varsity status. The Penguins moved from NCAA Division 2 into the MCLA during the off-season, and have been turning heads in their brief time in the MCLA. They knocked off perennial WCLL power Sonoma State and nearly upset Simon Fraser in their first two MCLA contests. The Mustangs will then turn right around and take on the #2 Arizona State Sun Devils on Sunday. It will be the first game between the two squads since ASU handed the Mustangs a close loss in the dome in Minnesota back in 2013. 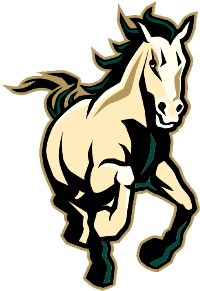 In 2012, it was Cal Poly knocking off the Sun Devils in the MCLA National Championship semi-finals. 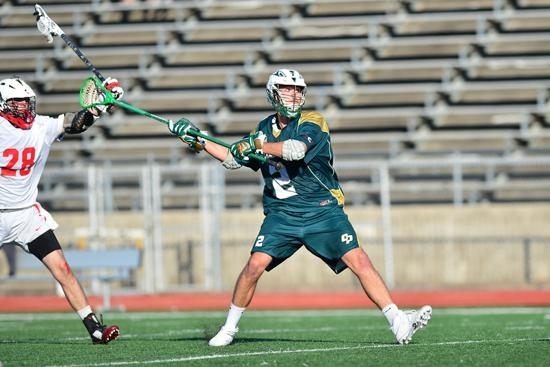 Saturday, February 28th, 2015 at 12:00 p.m.
Sunday, March 1st, 2015 at 1:00 p.m.
February 21, 2015 – Cal Poly Men’s Lacrosse held a free youth lacrosse clinic in conjunction with the local YMCA in anticipation of the upcoming spring youth league. Mustang midfielder is Zach Jones is interviewed on the KSBY broadcast. 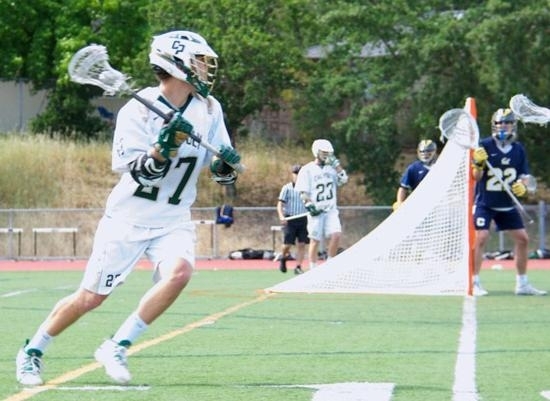 Senior captain Chris Nespor is interviewed on the CrosseFire MCLA podcast. After opening up the season with a home victory over the UCSB Gauchos, the Mustangs (3 – 0) took their first road trip of the season and knocked off the USD Toreros and San Diego State Aztecs. Cal Poly took down USD on Sunday with a dominant 11-3 victory after racing out to an 8-2 half time lead. Midfielder Anthony Varni led the way for the Mustangs with 4 goals and 1 assist, and the defense held the Toreros to only one goal over the game’s last 40 minutes. On Presidents Day, the Mustangs squared off against the San Diego State Aztecs. Coming into the game, Cal Poly had won the last four meetings between the two teams, but the Aztecs were fresh off of an upset over the #6 ranked BYU Cougars and hungry for another big upset. After racing out to 5-1 lead in the 1st quarter, Cal Poly was able to overcome a motivated and talented Aztec squad and bring home a comfortable 11-6 victory. The Mustangs were led by senior attackman Joseph Sarjeant with 2 goals and 3 assists and a stingy defense led by senior captain Luke Willon who collected 8 ground balls and limited a talented Aztec offensive unit. 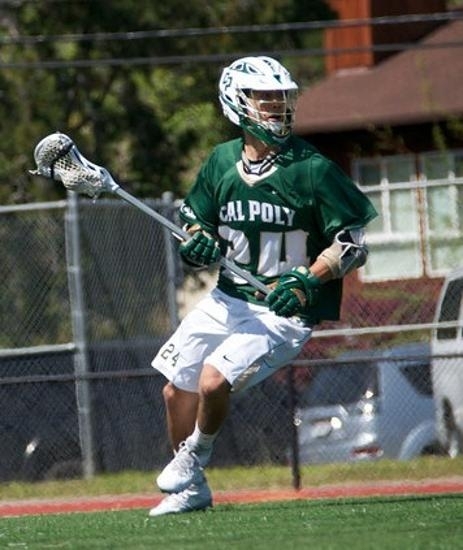 The Cal Poly men’s lacrosse team will open up the 2015 season with a Blue-Green rivalry game against the UCSB Gauchos on Saturday. The Mustangs come into the season ranked #13 nationally , while the Gauchos check in at #7 in the same MCLA pre-season coaches poll. The Mustangs come into the game with revenge on their minds. In their last meeting back in May 2014, the Gauchos knocked off Cal Poly in a double overtime thriller at the MCLA National Tournament. UCSB’s victory ended the Mustangs season and propelled the Gauchos into a Final Four appearance. Saturday’s contest against the rival Gauchos will be the Mustangs first official game since last year’s bitter defeat. The Mustangs look to use home field advantage to come out on top and earn the upset win on Saturday afternoon at the Cal Poly Sports Complex. Saturday, February 7th, 2015 at 1:00 p.m. 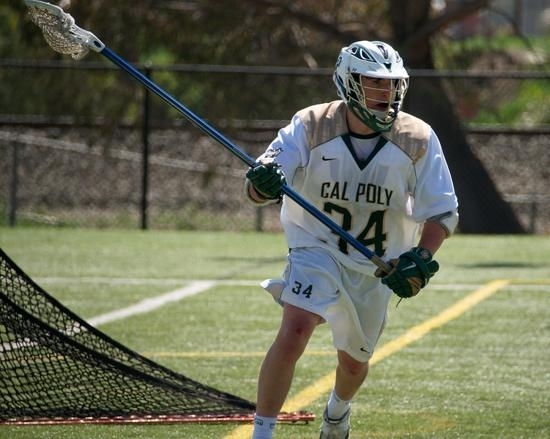 The Cal Poly Lacrosse team has named four senior captains to lead them into the 2015 season. Zach Jones , Chris Nespor , Joseph Sarjeant , and Luke Willon were selected by their teammates to represent them as leaders on and off the field. Zach Jones provides a steady presence at midfield and is one of the most well rounded players on the squad. He excels at breaking down the defense with shifty moves, feeding his teammates for the assist, or taking matters into his own hands for a diving goal during crunch time. Long-stick midfielder Chris Nespor led the team in ground balls and turnovers caused in both 2013 and 2014. He was named to the 1st team WCLL All-Conference squad and 3rd Team All-American squad in 2014. He is also one of only a select few Mustangs in program history who was voted captain for two seasons. Joseph Sarjeant led the team in points in 2014 during his breakout junior season, and was awarded 1st Team WCLL All-Conference honors. The senior attackman will anchor the offensive unit in 2015 as the Mustangs strive for their first national title. Senior defenseman Luke Willon will anchor the defense with his stalwart one-on-one defense, tremendous ground ball skills, and unmatched energy. Luke displayed his shut down defensive ability throughout the 2014 season and was named to the WCLL 2nd Team All-Conference squad.